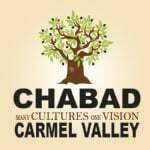 At the Chabad Carmel Valley our expectation is to make it meaningful while flowing throughout to keep the interest of both adult and child. Relive the Exodus, discover the eternal meaning of the Haggadah, and enjoy a community Seder complete with hand-baked Matzah, wine, and a wonderful dinner spiced with unique traditional customs. Experience the liberation and freedom of Passover. Discover the Seder's relevance to today's modern Jew. After completing the reservation you will receive the location and relevant details.